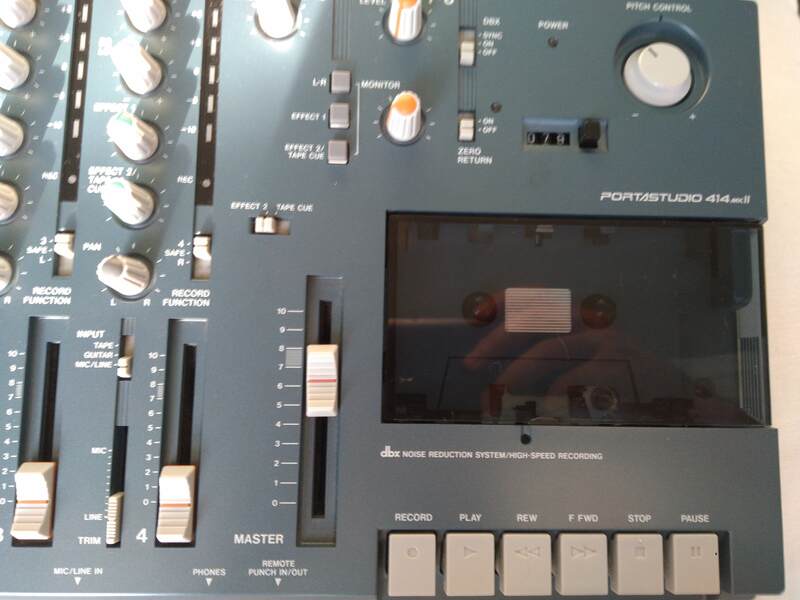 This four-track recorder was given to me as a gift almost three years ago. It's in almost every music store and catalogue around, and currently sells for around $299. If you want to perfect your playing by jamming along with your own grooves, or record demos of your own songs, but don't want to spend a grand for a digital recording system, go with this high-quality four-track. This may surprise you, but some four-tracks can't record four different tracks simultaneously. This one can. Each track has two effects sends and its own EQ. There are also two stereo inputs and stereo line and monitor outputs. The 414MkII, which is the most current model, also includes two XLR inputs (sweet)! I'm pretty convinced that this is about as good as four track tape recording gets. Using my Portastudio, I have cut two demos for my band, a demo of my own solo project, and dozens of side projects. And when I'm not recording, it comes in handy as a mixer as well. The instructions can be a bit confusing if you don't know alot about recording. You will probably gain a better understanding of the unit if you just work with it for a little while, but definitely read over the instructions first or you will be lost. Also, I have found the DBX noise reduction to be pretty useless. I recommend leaving it off at all times to acchieve the cleanest, purest sound possible, or you may find yourself missing some very important parts of an instrument's tone. 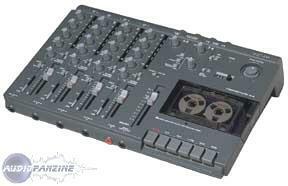 The Portastudio is a great four-track. The 414MkII has everything you need, and it's pretty compact. There is also a 424MkIII, but it's much more complicated, and sells for about a hundred dollars more. 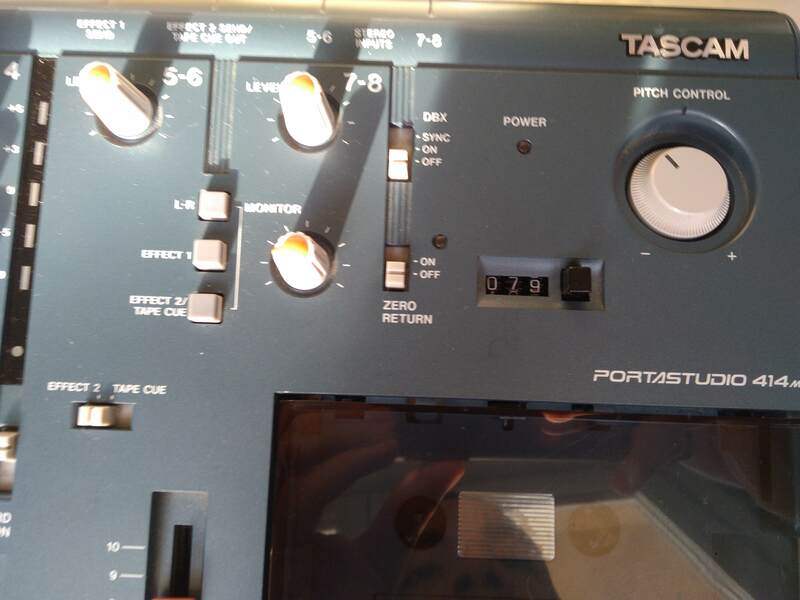 I would encourage any developing musician/songwriter to get a four-track. I believe you will find it to be a great learning tool. 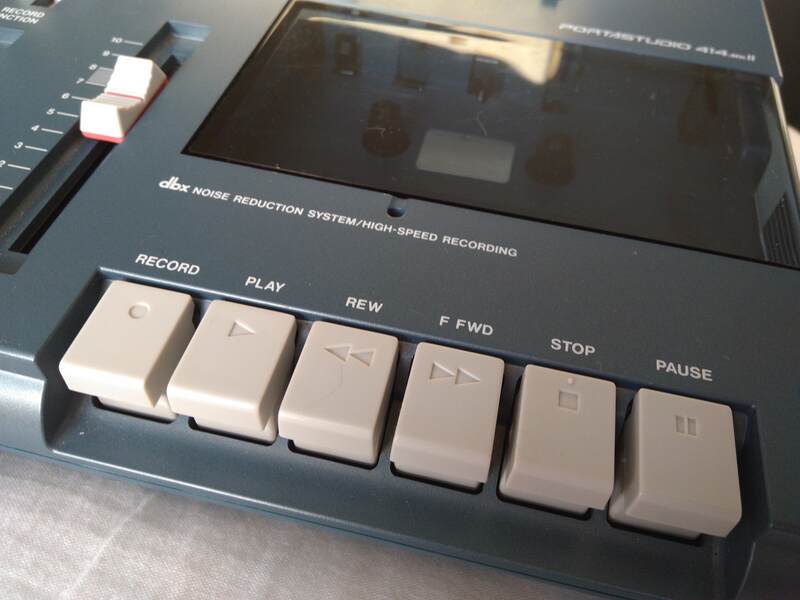 themaddog's review"Decent cassette based idea pad"
This is a cassette based (1/8") 4 track recorder that records on high bias, type II cassettes in a single direction. It has dbx type II noise reduction, but on my used machine this had drifted, so recordings sounded better without it engaged. dbx on track 4 can be disengaged separately for timecode purposes. There is a pitch wheel that allows for 15% plus or minus speed change, putting the wheel to the maximum speed will cut down on some of the tape hiss. There are four main channels which correspond to the four tracks. 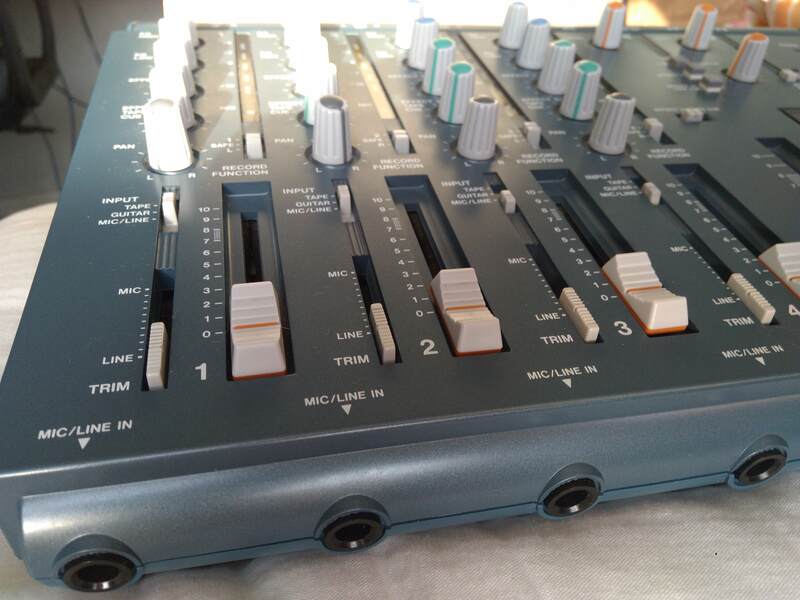 There are faders for these channels along with high and low eq knobs and pan controls. There are two stereo channels, 5-6 and 7-8 that can be used for effects routing or as auxiliary inputs. These channels only have volume knobs without an other control. Inputs are all 1/4" and RCA. All four tracks can be recorded onto simultaneously. There is an analog tape counter with engageable zero return. There are no facilities for automated punch ins, but there is an input for a punch in pedal. 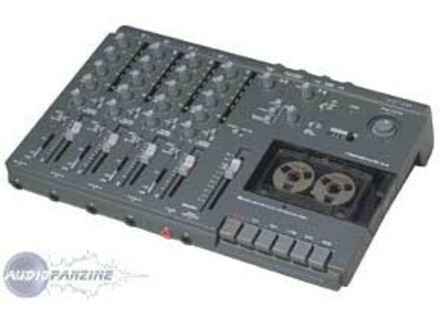 This machine is much more limited than its big brother the 424 and recordings are not as high quality as that machine. By comparison, this machine's recordings sound like the quality of the 488, which is an 8 track cassette Portastudio. Both of those machines (and the 464 as well) have more features in terms of punch in and digital control of the transport. But, this machine will function well as an idea sketchpad, for someone who insists on recording on cassette tape, or for someone who needs a more mobile solution than any of the above listed multitrack recorders. I purchased this for my classroom for the students to make some basic recordings. It has done a decent job in that capacity, but I soon replaced it with a 788, which with its MIDI capabilities was better suited to our purposes. Used for 5 years, 3 via burned mastering this bike, this 4 track K7 is a true off-road registration. I love its excellent natural dynamics. Obviously since I have tasted of digital is more convenient but less realistic (the cooler). Very good price / quality ratio, in addition it is the only model that resists recorders on the market and have been for many years. A reference, then! Excellent instruction manual showing the many possibilities. Line 4 inputs, 4-track recording and playback, stereo inputs plus or ability to insert effects loop, double frame rate (better dynamics), Dolby, sync (but it eats a track). In short, this bike is not a digital 16 000 bullets but for the price, you can learn to cheap recording / mastering analog and achieve very good MODELS !!!!!!!!! !